After our couple of days in the mountains near Theth, our appetites were whetted for a last taste of the Accursed Mountains. 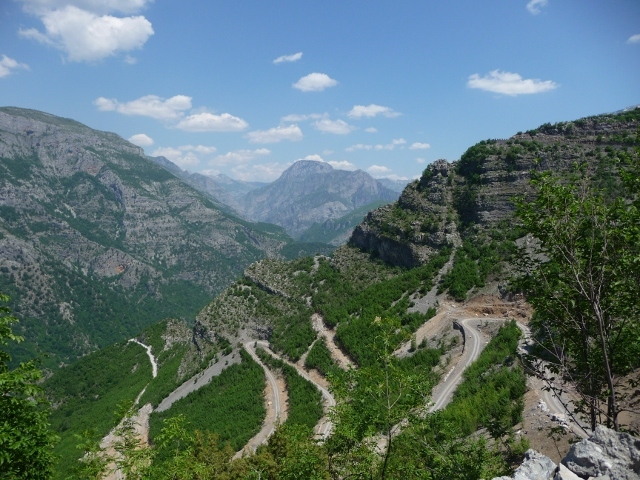 There’s another road on the map, north of the Theth road, which curls along the Montenegrin border towards the village of Vermosh. We’d heard that it was 4×4 only – but it had to be worth a look-see. The junction to the road, at Hani i Hotit, was where we’d realised we’d missed the Theth road so we knew exactly where we were heading this time… The tarmac road plunged straight across a plain away from Lake Shkodra, the largest body of water in the Balkans, and towards the mountains, where it suddenly changed from tarmac to dirt and from straight to very, very wiggly and steep. The road is being worked on, so is currently just a bed of rough crushed rock. We wound up innumerable hairpins, past the machinery being used to widen and (eventually, we presume) surface the road. Once at the top of the initial ascent, it headed through a village, then round some more bends – at which point, the vista opened up massively, giving us a huge gorge heading off into the distance. Wow. We looked down – and saw our road continue towards the gorge but far below us. Through the binoculars, the surface looked decent, so we continued onwards, down another steep series of hairpins. We wound round a couple of small side gorges, and towards the main river. After a few more kilometres, we were stopped by a guy in a dayglo jacket. We got out of the van, and walked towards the crest he was standing by. The road ahead was being actively worked on, with a large digger shifting rock from the road surface to the verge. Whilst it was clear that the digger would be moved out of the way in a few minutes, that would have left the road far too rough for us to realistically traverse. In addition, the descent they were working on was far steeper than any we’d come across to that point. We could probably get down it, but would we be able to get back up again? We’d previously set ourselves a “last turn-around” time, after which we’d be staying there overnight no matter what. That time was approaching rapidly, and it all started to look like the only sensible decision was to accept that we’d met a barrier too far. We’ve been massively impressed by the rough road capabilities of our van, but at the end of the day if we break it, we’ve got ourselves a very big problem indeed. Since it was now mid afternoon on Saturday, and our Albanian insurance expired on Monday, we didn’t really have any slack time to resolve any issues either. So, reluctantly, we did a U-turn and headed back out. We might not have got all the way to Vermosh, but we’d seen yet more astounding scenery, and we’d got far further than we could realistically have done in any other type of motorhome or campervan short of one with 4×4 and significantly higher ground clearance. On the way back up, though, we stopped to have a check under the van after one particularly rough section – and found that we were missing something fairly important… The waste tap for our grey-water tank. Where it had been, we just had a large hole in the lower edge of the tank. Whilst the tank itself didn’t appear to be damaged, and the tap had merely been pulled out of the threads, we had to face the fact that any water that we drained out of the sink wouldn’t be contained but would pour straight onto the ground – not something that’s particularly ideal for maintaining good relations with campsite owners. As we headed back to the campsite we’d been at a few days previously, Camping Albania, we spotted a small shop piled high with building and plumbing equipment outside. Perfect. We went in, quickly ascertained nobody there spoke anything but Albanian, and attempted to make ourselves understood through mime. Fortunately for our sanity, the ubiquitous translator was quickly found, and our plight became understood. Another passer-by took charge of the situation, and was rummaging through the stock of plumbing fittings for something about the right size. After a couple of attempts, a bung was found, and screwed in to place. It seemed to hold water. Great. Time to pay. No, it was quite definitely not time to pay. Not only did our assistant refuse to let us do so, insisting on paying for the bung himself, but he was quite firm that we should also join him for a drink in his cafe. Given that it was another 30degree day, it wasn’t exactly a difficult suggestion to agree to – and the price of a couple of drinks was not a heavy one for his help. But, no – once we’d finished our drinks, he was again adamant. If we were to meet in London, then it would be our turn to buy the beers. In Bajzë, though, he was the host. Whilst we’d been having the drink, a guy in his twenties had been brought in. His English was flawless, and we had a chat about the economic realities of life in Albania. He’d spent, he told us, two months living in London. Whereabouts? Harmondsworth. We chatted on. It turned out that his stay in Harmondsworth had not been entirely voluntary, but had been enforced upon him by his method of entry into the UK… He’d travelled to Ireland, as Albanians are free to do, then crossed over the land border into Ulster, and on to the mainland. Without, of course, a visa for the UK. And that’s how he came to be in the detention centre for illegal immigrants awaiting deportation. His extended stay there was due to what he freely admitted to be a wildly optimistic attempt to seek asylum – turned down, of course, as without grounds. He held no grudge against the UK, and retained his ambition of living and working there. 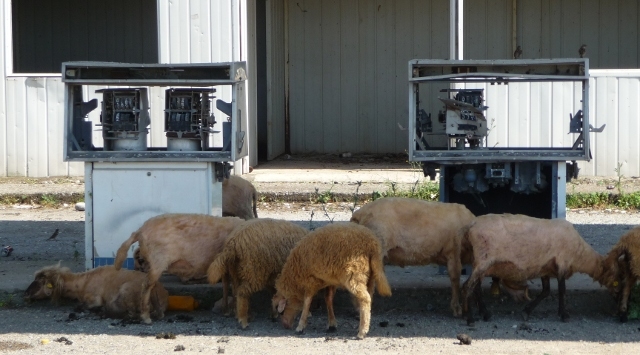 In Albania, it’s incredibly difficult to get a job – and if/when you do, you earn a pittance. €2-300 per month is regarded as decent. Sure, many costs are low, but many others are near to the European norm. Then, of course, there’s the barriers put in place by corruption. To get that job, you have to pay the person recruiting you. Often, nearly a year’s salary is required. An amount which you have to take out a bank loan for, meaning that most of your pay for several years is spent even before you’ve earned it. If you travel abroad, though, it’s possible to earn as much in the three months which Albanians can stay visa-free in a Schengen country as in a whole year at home. As we sat in the last shreds of sunset at the campsite, an expedition-equipped Toyota LandCruiser 4×4 pulled in and parked up next to us. 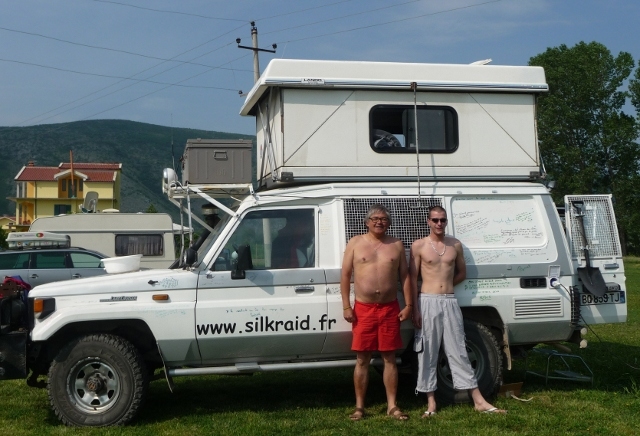 Writ large upon the side was the web address http://www.SilkRaid.fr – and we quickly made two new friends. Pierrot has had to retire early due to ill health, but his ambitions were undimmed. His mother had been from Laos, and whenever they’d returned it’d been by air. Now, he wanted to go overland. His wife was going to fly out to meet him in six months time, whilst his son, Clement, was coming with him. Even better, it was Pierrot’s birthday. And so our last night in Albania drew to an end accompanied by the popping of champagne corks and a pyrotechnic confetti-bomb. 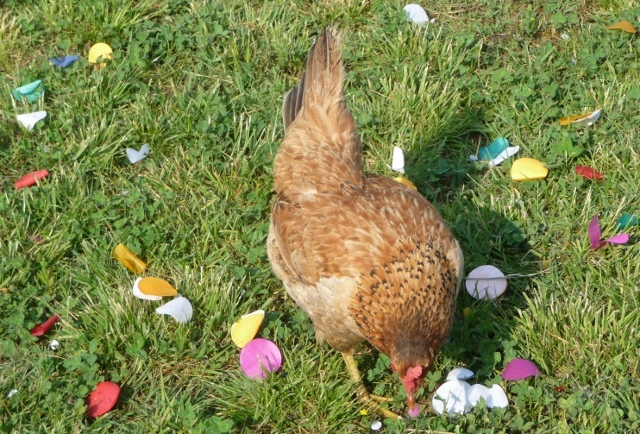 We awoke and shooed the chickens away for long enough to clear up the paper confetti they were trying to eat. 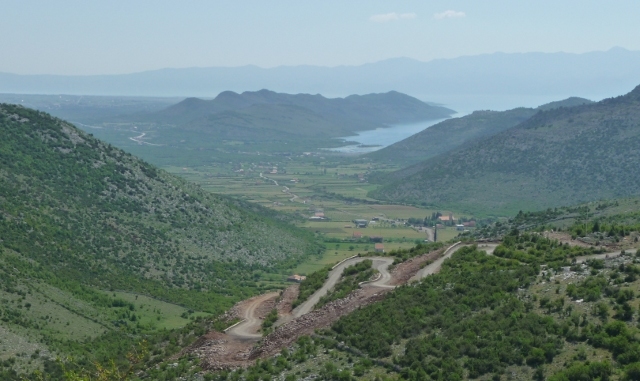 There was no doubt about it – the time had come to head towards the Montenegrin border. After a long and protracted saga of proving that the knowledge to be gained on the internet is much greater than that held by alleged experts, we’d managed to convince our insurer that as a step towards Serbia’s impending EU membership Green Cards were no longer required and that our policy was indeed valid there. After escalating this from the broker – a specialist brand of one of the UK’s largest insurance chains – to the actual insurance company behind the policy, we finally got agreement that this was a country we wouldn’t need to buy an expensive and restrictive border policy for. However, our certificate still didn’t list the country on it, so we requested something in writing just in case we had any police or border problems. No problem – they’d be glad to issue us with… a Green Card. When an emailed copy arrived, we noticed an interesting wrinkle. Whether due to the fact that, since they didn’t know about the change, they still only had old copies of the Green Card in stock, we don’t know – but the Green Card that arrived had SRB for Serbia listed in the pre-change manner. 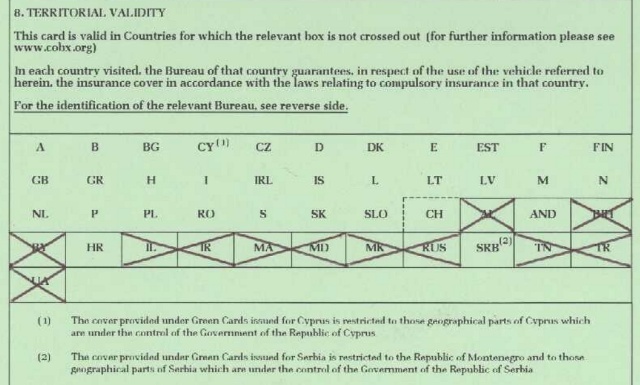 And since the change meant that Montenegro could no longer outsource their own insurance management to their bigger neighbour, MNE was not listed at all, but was explicitly mentioned in writing as being covered by the SRB box. That left us with a little dilemma. Was this Green Card actually valid at all? And if so, for where? The insurer hadn’t mentioned Montenegro at all (they probably hadn’t heard of it), but they’d been adamant that Serbia and Croatia were the only countries they would provide cover for. A little digging into the workings of the international insurance agreements revealed a couple of details that gave us grins. Not only were the old Green Cards still valid for two years as a transition arrangement, but if an insurer issued a Green Card for a country in error, they had to stand by it. We were definitely covered for Montenegro, a country with a reputation for the most expensive border policies in the region. We arrived at the border, and whilst we sat in the queue of cars on the Albanian side, our passports and van registration had been collected by a very friendly border guard, together with those of everybody else in the queue. As he sauntered back to the hut, we wondered if we’d ever see our OWN papers again out of the large stack he had in his hand. At the first hut, we were glanced at, a pair of vaguely familiar looking passports were stamped then passed round the back to the second hut. We were asked for our Green Card. It suddenly dawned on us that – instead of there being two separate border bureacracies joined by a No-Man’s Land, when the EU-branded sign behind the huts proudly proclaimed “The First Joint Border Crossing In The Balkans”, this was what it meant. This was the Montenegrin entry, not the Albanian exit. We handed over our colour print-out, held our breath and crossed our fingers. He studied it, turned it over, and looked sceptical. “It has been emailed to us – this is normal in the UK for insurance papers”. A grunt. Our very own passports were stamped, handed back to us along with the car papers, and we were waved forwards. We were in Montenegro. 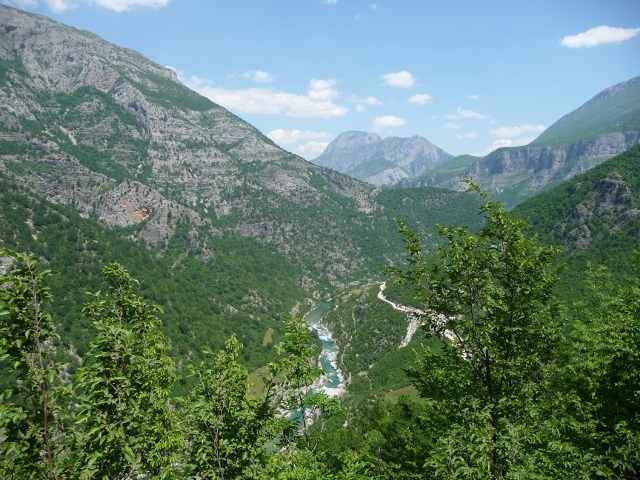 There really is nowhere like Albania. We left with the feeling that there have been three of the best weeks of the trip so far, and a determination to return. This entry was posted in Art & Culture stuff, By Country - Albania, By Country - Montenegro, Officialdom stuff, Travel stuff, Van stuff. Bookmark the permalink. I’m another subscriber due to Lynne, dovegreyreader, and I’m interested in the joint venture into patterning. I’m especially fond of champagne and thought how good it must have tasted after that very bumpy drive. Well done for sorting out the insurance – phew!